Bite Deep And Wide, O Axe, The Tree! Isabella Valancy Crawford was a 19th century Canadian poet and novelist who emigrated with her family from Ireland in 1856. She was one of the first freelance writers in Canada and is considered, by most, to be her adopted country’s first major poet. Unfortunately her fame came mostly after her untimely death. She was born on the 25th December 1846 in Dublin, the daughter of a doctor who successfully got a licence to practice medicine in Western Canada in 1857. Life was hard in Paisley, the small town where they settled, and a financial scandal caused them to move to Lakefield after only four years. This was a place without a doctor and they were taken in by the Strickland family initially. The young Isabella was quickly influenced by the sisters of their host, writers Susanna Moodie and Catherine Parr Traill, and it is believed that this was the time when she began composing her own poetry. Her first published work came when the family moved on once more, this time to Peterborough. 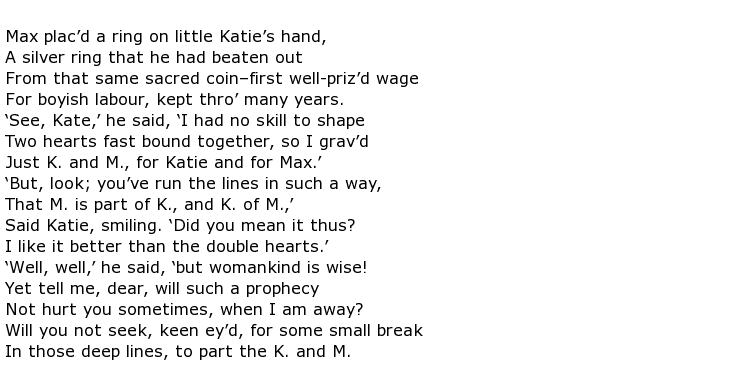 A poem called A Vesper Star was published in the Toronto Mail on the Christmas Eve of 1873. Her father died two years later and it became apparent that Isabella needed to earn enough money from writing to support her mother and one surviving sister, Emma. Tragically Emma died shortly afterwards and the two remaining women moved to Toronto where it would be easier to get work published. Crawford found many outlets for her work, submitting serialised novels as well as a number of poems to various newspapers and periodicals in New York and Toronto.